Blog Post From Dept of Interior: Is the Recent Increase in Felt Earthquakes in the Central US Natural or Manmade? Last week, following the publication of an abstract intended to preview an upcoming talk by a U.S. Geological Survey (USGS) scientist, a number of news articles started popping up about new scientific evidence of a link between unconventional oil and gas production here in the United States, and seismic activity (earthquakes). Unfortunately – although not surprisingly given the limited information available in the abstract – the accuracy of these media reports varied greatly. With this blog post, I want to clarify a few points about USGS’s important and ongoing work to study induced seismicity. Science will continue to play a critical role as the Obama administration moves forward with an all-of-the-above strategy for American energy. USGS’s contributions to this effort, including scientist Bill Ellsworth’s work on the correlation between wastewater injection sites and seismicity, represent an important part of the overall dialogue about how we can continue to expand domestic oil and gas production safely and responsibly. As part of its ongoing effort to study a variety of potential impacts of U.S. energy production, USGS scientists have been investigating the recent increase in the number of magnitude 3 and greater earthquakes in the midcontinent of the United States. Beginning in 2001, the average number of earthquakes occurring per year of magnitude 3 or greater increased significantly, culminating in a six-fold increase in 2011 over 20th century levels. These earthquakes are fairly small – large enough to have been felt by many people, yet small enough to rarely have caused damage. An increase in earthquakes such as this prompts an important question: are they natural, or man-made? To address this question, a team of USGS scientists led by Bill Ellsworth of the Earthquake Science Center analyzed changes in the rate of earthquake occurrence in the midcontinent using large USGS databases of earthquakes recorded since 1970. Our scientists then took a closer look at earthquake rates in regions where energy production activities have changed in recent years. The following findings will be presented on April 18 at the annual meeting of the Seismological Society of America, with a published study forthcoming. 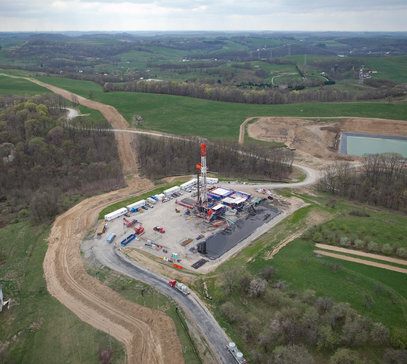 USGS’s studies do not suggest that hydraulic fracturing, commonly known as “fracking,” causes the increased rate of earthquakes. USGS’s scientists have found, however, that at some locations the increase in seismicity coincides with the injection of wastewater in deep disposal wells. Wastewater is a byproduct of oil and natural gas production from tight shale formations and coal beds. Generally, wastewater produced from many oil and gas production wells within a field may be injected through a single or just a few disposal wells. In preliminary findings, our scientists cite a series of examples for which an uptick in seismic activity is observed in areas where the disposal of wastewater through deep-well injection increased significantly. These areas tend to be in the middle of the country – mostly in Colorado, Texas, Arkansas, Oklahoma and Ohio. While it appears likely that the observed seismicity rate changes in the middle part of the United States in recent years are manmade, it remains to be determined if they are related to either changes in production methodologies or to the rate of oil and gas production. We also find that there is no evidence to suggest that hydraulic fracturing itself is the cause of the increased rate of earthquakes. The fact that the disposal (injection) of wastewater produced while extracting resources has the potential to cause earthquakes has long been known. One of the earliest documented case histories with a scientific consensus of wastewater inducing earthquakes, is at the Rocky Mountain Arsenal well, near Denver. There, a large volume of wastewater was injected from 1962-1966, inducing a series of earthquakes (below magnitude 5). We also have previously reported that the production of oil and gas (extraction) can potentially cause earthquakes when changes in the underground stresses created by the removal of large volumes of oil, gas or water are large enough. And, of course, we know that the Earth’s crust is pervasively fractured at depth by faults. These faults can sustain high stresses without slipping because natural “tectonic” stress and the weight of the overlying rock pushes the opposing sides of the fault together, increasing the frictional resistance to fault slip. The injected wastewater in deep wells can counteract the frictional forces on faults, causing an earthquake. Not all wastewater disposal wells induce earthquakes. Of approximately 150,000 Class II injection wells in the United States, including roughly 40,000 waste fluid disposal wells for oil and gas operations, only a tiny fraction of these disposal wells have induced earthquakes that are large enough to be of concern to the public. Information on wastewater disposal wells and the US Environmental Protection Agency’s Underground Injection Control program is available online. Earthquakes induced by fluid-injection activities are not always located close to the point of injection. In some cases, the induced earthquakes have been located as far as 6 miles from the injection well. The USGS is coordinating with other federal agencies, including the EPA and Department of Energy, to better understand the occurrence of induced seismicity through both internal research and by funding university-based research with a focus on injection-induced earthquakes from wastewater disposal technologies. For instance, USGS and its university partners have deployed seismometers at sites of known or possible injection-induced earthquakes in Arkansas, southern Colorado, Oklahoma, and Ohio. Currently, there are no methods available to anticipate whether a planned wastewater disposal activity will trigger earthquakes that are large enough to be of concern. Evidence from some case histories suggests that the magnitude of the largest earthquake tends to increase as the total volume of injected wastewater increases. Injection pressure and rate of injection may also be factors. More research is needed to determine answers to these important questions. Although we cannot eliminate the possibility, there have been no conclusive examples linking wastewater injection activity to triggering of large, major earthquakes even when located near a known fault. It’s clear that science is a key part of the Obama administration’s all-of-the-above strategy for American energy, and we will continue to research these important questions – working with industry and our state, federal and academic partners to ensure that we continue to expand oil and gas production safely and responsibly in the United States. This entry was posted in Education / Information, News / Media and tagged DIO, earthquake occurrence, man made, ohio, seismic, Texas. Bookmark the permalink.